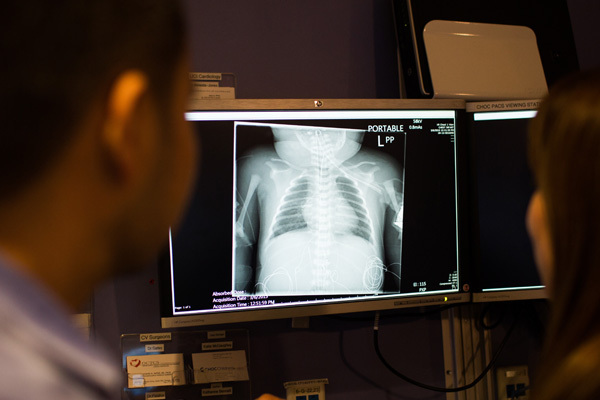 Children with heart conditions need very specialized care. 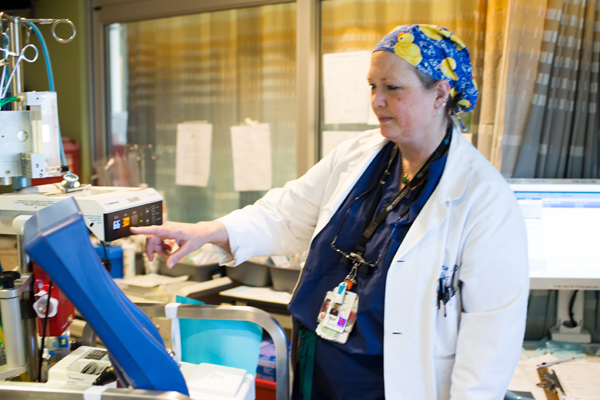 Our exceptional cardiac-trained intensive care specialists, nurse practitioners and critical care registered nurses staff the Heart Institute’s 12-bed cardiovascular intensive care unit (CVICU) around the clock. Each patient has a spacious single room with sleeping accommodations so a parent may spend the night in their child’s room. All of the CVICU rooms are outfitted with leading-edge technology equal to the demands of monitoring children after complex operations. This technology includes near infrared spectroscopy (NIRS) monitoring to non-invasively measure oxygen saturation, continuous venous oximetry as a marker of cardiac output, EEG monitoring for postoperative seizures, in-unit CT scanning and X-ray and extracorporeal life support (ECLS)—a life-saving technology not found anywhere else in Orange County. In addition, rapid-assessment bedside ultrasound can be used at any time to instantly calculate pulmonary artery pressures and ejection fraction. The unit also includes two fully equipped rooms that transform into operating suites, enabling our specialists to perform emergency, life-saving procedures on children too unstable to be transported out of the unit. These rooms can also be combined with neighboring rooms, as needed, to accommodate extra equipment or family members visiting seriously ill children. In addition, our CVICU also offers two negative air flow rooms with double door entry can be used to prevent the spread of possible contagious infections if required. The staff in our CVICU is dedicated to providing our patients the very specialized care they need around the clock. In addition to round-the-clock bedside nursing care, the unit has dedicated, highly trained cardiac nurse practitioners, respiratory care and cardiac-trained intensive care physicians. When a new patient comes to the CVICU straight from surgery, operating room staff work one-to-one with their CVICU counterparts to make sure all of the patient’s immediate and long-term needs are met and that crucial information is passed along to each staff member who will be providing the patient’s care. At the Heart Institute, we understand that when a child is ill and needs hospitalization, the entire family is affected. We invite CVICU parents to participate in daily multidisciplinary team rounds and encourage them to be active in the decisions that are made regarding their child’s care. 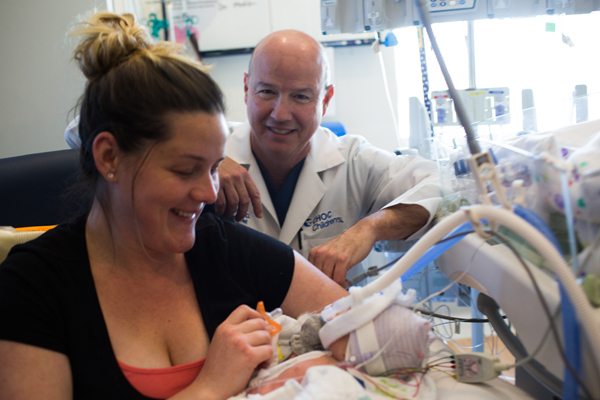 Our compassionate and caring child life specialists support each patient and his or her parents and siblings by providing guidance on what to expect as the patient recovers. Specialists also bring activities, toys and movies while patients recover and help motivate children who may be reluctant to get out of bed after their procedure. Child life specialists even work with our tiniest infants to make sure they are held and played with while their family members are not able to be with them. In short, our child life specialists help kids stay kids while at CHOC. CHOC Children’s is the only institution in Orange County to offer extracorporeal life support (ECLS), a lifesaving technology that supports the heart and lungs by taking over the heart’s pumping function and the lung’s oxygen exchange until patients can recover from injury, surgery or illness. Learn more about ECLS. Patients who have undergone complex, cardiovascular procedures at the CHOC Children’s Heart Institute require specialized care and attention. Learn about our courageous patient, Cyrus, who underwent complex open heart surgery. His successful journey was met by much celebration from his family and his team of CHOC experts. Children who are hospitalized with critical cardiac or pulmonary disease and don’t respond to current medical treatments might be candidates for a life-saving device called extracorporeal membrane oxygenation (ECMO).